We are pleased to welcome you to the March-April 2018 issue of World Neurology, the official publication of the World Federation of Neurology (WFN). In this issue, a number of WFN initiatives are discussed, beginning with the Presidents’ Column where WFN President William Carroll discusses the new steps taken by the new administration of the WFN as outlined at the recent strategy meeting that took place in London. In this issue, we are also pleased to announce the seventh year that the WFN is offering educational grants to sponsor high impact educational and outcome-based research projects. Interested young investigators should waste no time as the deadline for applications is quickly approaching. 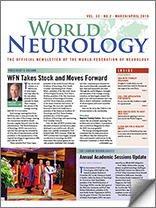 Another important announcement in this issue is the invitation for bids from national member societies in the Americas to host the World Congress of Neurology (WCN) in 2023. The theme for this year’s World Brain Day (July 22, 2018) campaign is also announced in this issue and all neurological societies are encouraged to participate. John D. England, the editor-in-chief of the Journal of the Neurological Sciences, the official journal of the WFN, announces a special issue devoted to tardive dyskinesia, edited by Dr. Daniel Truong and Dr. Robert Hauser. It is available free online for all readers through 2018. Dr. Udaya K. Ranawaka reports on the 11th Annual Academic Sessions of the Association of Sri Lankan Neurologists that was held last November. Professor Jan Kuks announces the next examination of the European Board of Neurology that will be taking place on June 15, 2018, at the European Academy of Neurology Congress in Lisbon. Martin Kaddumukasa, MD, reports on his eye-opening visit to St. Josef Hospital in Cochum (University Clinic of Ruhr University) in the department visit program sponsored by the German Neurological Society and the WFN. In this issue’s history column, Douglas Lanska reports on his interview with Nobel laureate Stanley Prusiner on the origin of the term prion, an article that should be of both historical and medical interest to all readers. Eduardo Wilson provides a biography of Victor Soriano, who is honored by the Soriano lectures held every two years at the World Congress of Neurology. Finally, Nadir Bharucha provides a touching obituary of Professor Eddie Phiroz Bharucha, a pioneer of neurology in India, who passed away in December and whose name will also live on in an endowed lectureship at the World Congresses of Neurology.